The final day on Calf Hill was warm and fine. How far do the cobbles extend under the bank in Trench 3? What is underneath the cobbles in Trench 2? 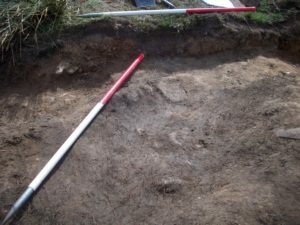 What is the dark linear feature in Trench 3? Continuing with the sondage started in Trench 3 on day 6, the cobbles were traced. With the exposed cobbles in Trench 2 the cobbled layer was found to be at least 8½ feet wide. The end of the cobbles was not found in the north of Trench 2.
the recent dry weather shows the drainage channels on Calf Hill running in the opposite direction. The dark linear feature possibly relates to the robbing out of the bank. A sondage was put in to the south west corner of Trench 2 to find out what was underneath the cobbled layer. Unfortunately, no reason was found for the metal detector signal in this area of the trench. It is possible that the boot heel found on a previousday was the reason for this signal. It was found that the cobbles are the top of a well engineered road surface. The road construction was examined to a depth of 14inches below the cobbled layer where natural geology was found. The bank in Trench 1 is much higher than other areas of the monument, suggesting it was altered. A possible date for alteration would be during 1WW training. The stone feature in Trench 2 is above the cobbled layer. Was this a firing step for the 1WW trench construction? Was the metal spike also part of this? The cobbled layer extended underneath the bank in Trench 3. Either the bank was constructed after the road, or the bank in this area has been eroded over the road. Excavation of the northern bank would solve the order of construction of the road and bank. The road found in Trench 2 is of substantial construction and seems to have been in use/resurfaced over a long period. The construction suggests a Roman origin for the road, although further research is required to confirm this. 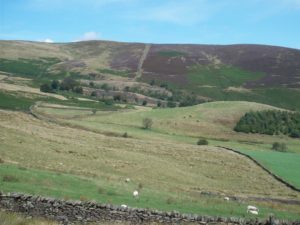 Was it a Roman B road between Ribchester and Elsack? It is possible that the road was visible in the 13th century, and was used as a basis for the vaccary ditch and bank. The road seems to continue towards the reservoir. 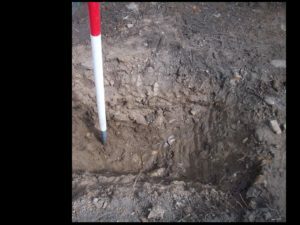 Further survey and test pits will confirm its existence and extent.The dark linear feature in Trench 2 does not relate to drainage as it is running in the opposite direction to the drainage culverts visible in a recent photograph. The feature is not prehistoric in origin. The area between the banks is not a ditch but a road. No pottery was found in the excavation. The features do not relate to habitation. 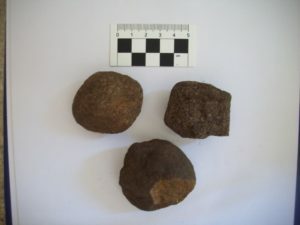 Few finds were found during excavation. Further analysis will be undertaken and a report written in due course. 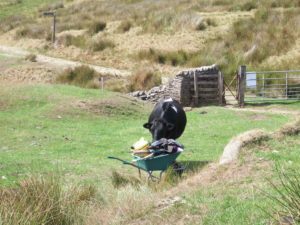 Gayle, Roger, Lynn, Alan, Brian, RichardH, Marie, Adam, David, Rebecca, Frances, Georgina, Peter C, Barbara and family, Neal for all your hard work during the excavation. All images courtesy of C Rousseau Jones, throughout the dig. Gertrude & friends courtesy of Bobby Gill, they made made our day in more ways than one! Banner image: Blue sky thinking?